I have been invited to join a blog tour where we would discuss our writing process and link up with other bloggers whom we want to introduce our readers to. I was tagged by a good friend of mine, Michelle who blogs on MummyWee. Michelle is a friend from my Junior College days and among all my friends, she is one who is usually very cool tempered and very easy to get along with. If, there was anyone whom I had thought could have a multitude of children, she would be the one. And in her blog, she writes about her experiences staying sane with six children. Yes, you heard right, SIX children! She discusses everything from sleep issues, PSLEs, fun places to visit and her parenting style. Currently I am working on a few topics that are close to my heart regarding parenting. On the top of my list is about the use of the electronic screens, e.g smartphones, tablets, computers and TV. The other topics include the importance of one-on-one time and the use of "teachable moments". Due to our experience of living in different countries over the last 9 years, I find my parenting style and, therefore, my writing very much influenced by the countries I lived in. In our local (Singaporean) context, some differences might be more glaring than others. Considering that blog was started in Canada, continued in France and now relaunched in Singapore, the topics span across three continents. When I started this blog nine years back, it will to document my pregnancy journey, then it become a great way for families and friends to stay connected to our lives, especially that of my children. Slowly, as I mature as a parent, I found that I wanted to share more about my parenting journey and what I found worked for me. Now, I find myself being passionate about families and this is one channel where I can share my experience with other parents. As part of my desire to serve families, I am also a facilitator for "Parenting with Confidence" workshops and I will be starting a graduate diploma in counselling to focus on marriage/family/children counselling soon. First and foremost, I write about the activities that involve my children, from their weekend activities to birthday celebrations and our holidays. These provide me with the basic material to keep the blog going. At the time, I find myself preparing drafts on pertinent topics that I either read about or happen to be discussing with fellow parents. At the moment, these topics are secondary as I find myself trying to catch up with a backlog of post of the various activities that we have enjoyed in the last six months. 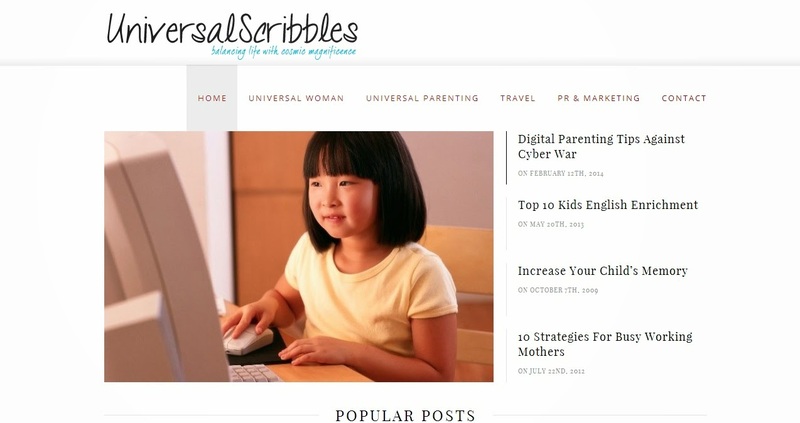 And next up, I have tagged another mummy blogger/writer, Meiling, who writes on Universal Scribbles. I met Meiling when both of us were going through a course to become facilitators for the Parenting with Confidence workshops. There, we realised that our kids were attending the same kindergarten! Universal Scribbles is a blog about fining a balance between motherhood and having a successful career. Something that I am sure resounds with most of us. Find out more about Meiling's writing process next week on 16 June.